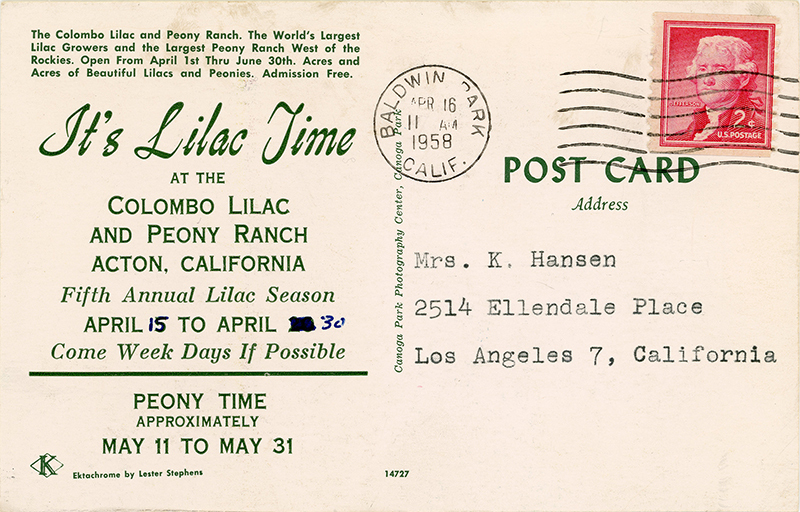 SCVHistory.com LW3204 | Acton | Colombo Lilac and Peony Ranch, Postcard 1958. 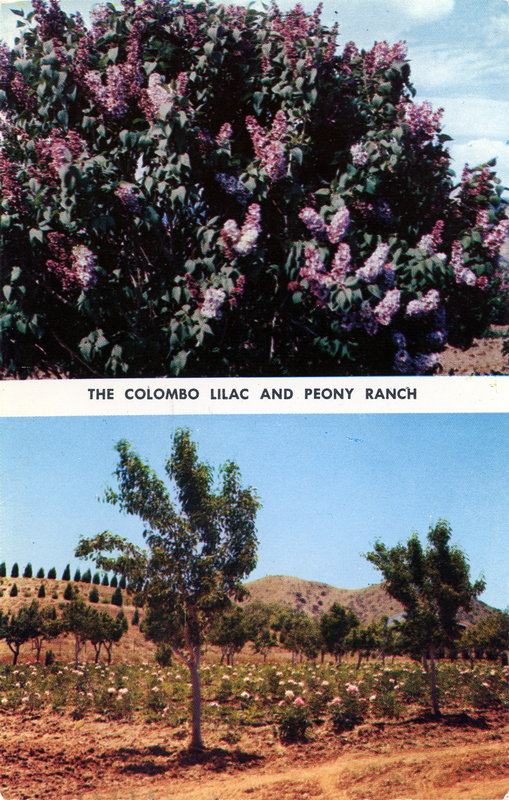 The Colombo Lilac and Peony Ranch. The World's Largest Lilac Growers and the Largest Peony Ranch West of the Rockies. Open from April 1st thru June 30th. Acres and Acres of Beautiful Lilacs and Peonies. Admission Free. Born in 1903 on what is now the Italian Riviera (at Sestri Levante), Christopher Colombo Brevidoro came to the United States and settled into Southern California's large Italian immigrant community. He worked at a vineyard in Rancho Cucamonga and then at a nursery in Glendale where he met his bride, Ida Ghio. The couple ran a flower stand in Pasadena, where purple lilacs were popular among East Coast transplants, when they married in the late 1920s. They started a family just as the Depression took hold, and Chris went into business with Giovanni Mellano, a major L.A. florist. On a hunting expedition with Mellano in the San Gabriel Mountains near Acton, Chris saw wild lilacs growing. The year was 1935. He leased a three-quarter section of 120 acres along Arrastre Canyon Road with an option to buy, and started planting lilacs. He purchased 60 acres by the time his first harvest came in 1944 or 1945. It was an immediate sell-out at the Los Angeles flower market. * The success enabled Chris to break from Mellano and go solo. In 1946 Chris and Ida relocated from Norwalk to the ranch in Acton and grew lilacs and peonies full-time. Their sons had gone off to war; now son John would become and attorney and son Robert a teacher. They helped out at the ranch from time to time and would become more active in it in later years. Chris supplied wholesalers in Los Angeles and also opened the harvest to the public every year from 1953-54 to 1994. He supplemented his income by dabbling in Acton real estate. The ranch was still a family-owned concern when Chris died in 2002 at age 99. He is interred at Eternal Valley Cemetery in Newhall. In 2003, sons John and Robert Brevidoro donated 1.5 acres of land on Crown Valley Road to the County of Los Angeles for what would become the county's Acton-Agua Dulce Christopher Colombo Brevidoro Library, which opened its doors to the community September 29, 2010. * Ridgway, Peggi, and Jan Works. "Sending Flowers to America: Stories of the Los Angeles Flower Market and the People Who Built an American Floral Industry." Los Angeles: American Florists' Exchange Ltd., 2008. For more about the origins of the library, visit the Friends of Acton-Agua Dulce Library. Watch the grand opening of the L.A. County Acton-Agua Dulce Christopher Colombo Brevidoro Library here. Nestled among the moonscape of rocks and stunted yucca trees in Acton is a strange and lovely sight: acres of purple-and-white lilacs thriving in the desert air. 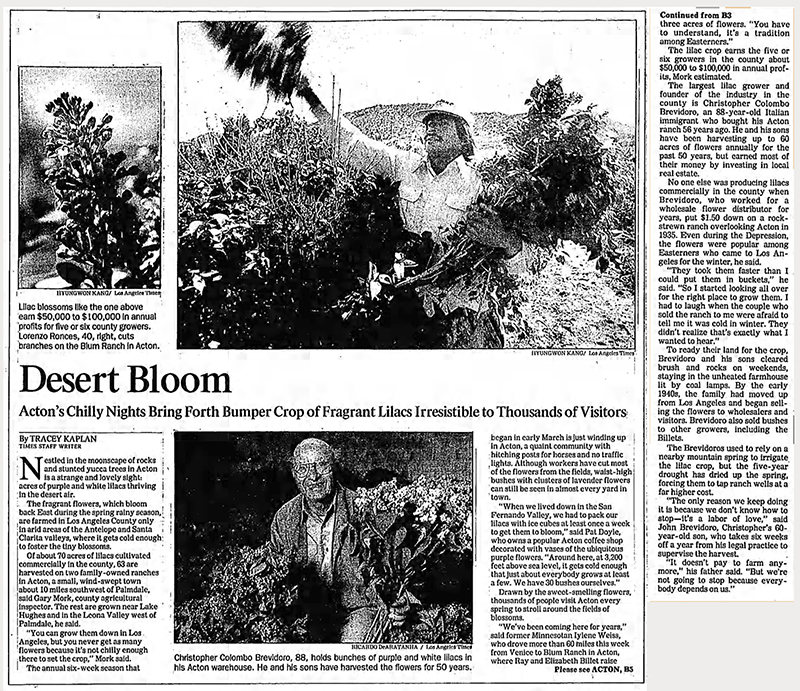 The fragrant flowers, which bloom back East during the spring rainy season, are farmed in Los Angeles County only in arid areas of the Antelope and Santa Clarita valleys, where it gets cold enough to foster the tiny blossoms. Of about 70 acres of lilacs cultivated commercially in the county, 63 are harvested on two family-owned ranches in Acton, a small, wind-swept town about 10 miles south of Palmdale, said Gary Mork, county agricultural inspector. The rest are grown near Lake Hughes or in the Leona Valley west of Palmdale, he said. "You can grow them down in Los Angeles, but you never get as many flowers because it's not chilly enough there to set the crop," Mork said. The annual six-week season that began in early March is just winding up in Acton, a quaint community with hitching posts for horses and no traffic lights. Although workers have cut most of the flowers from the fields, waist-high bushes with clusters of lavender flowers can still be seen in almost every yard in town. "When we lived down in the San Fernando Valley, we had to pack our lilacs with ice cubes at least once a week to get them to bloom," said Pat Doyle, who owns a popular Acton coffee shop decorated with vases of the ubiquitous purple flowers. "Around here, at 3,200 feet above sea level, it gets cold enough that just about everybody grows at least a few. We have 30 bushes ourselves." Drawn by the sweet-smelling flowers, thousands of people visit Acton every spring to stroll around the fields of blossoms. "We've been coming here for years," said former Minnesotan Iylene Weiss, who drove more than 60 miles this week from Venice to Blum Ranch in Acton, where Ray and Elizabeth Billet raise three acres of flowers. "You have to understand, it's a tradition among Easterners." The lilac crop earns the five or six growers in the county about $50,000 to $100,000 in annual profits, Mork estimated. The largest lilac grower and founder of the industry in the county is Christopher Colombo Brevidoro, an 88-year-old Italian immigrant who bought his Acton ranch 56 years ago. He and his sons have been harvesting up to 60 acres of flowers annually for the past 50 years, but earned most of their money by investing in local real estate. No one else was producing lilacs commercially in the county when Brevidoro, who worked for a wholesale flower distributor for years, put $1.50 down on a rock-strewn ranch overlooking Acton in 1935. Even during the Depression, the flowers were popular among Easterners who came to Los Angles for the winter, he said. "They took them faster than I could put them in buckets," he said. "So I started looking all over for the right place to grow them. I had to laugh when the couple who sold the ranch to me were afraid to tell me it was cold in winter. They didn't realize that's exactly what I wanted to hear." To ready their land for the crop, Brevidoro and his sons cleared brush and rocks on weekends, staying in the unheated farmhouse lit by coal lamps. By the early 1940s, the family had moved from Los Angeles and began selling the flowers to wholesalers and visitors. Brevidoro also sold bushes to other growers, including the Billets. The Brevidoros used to rely on a nearby mountain spring to irrigate the lilac crop, but the five-year drought has dried up the spring, forcing them to tap ranch wells at a far higher cost. "The only reason we keep doing it is because we don't know how to stop — it's a labor of love," said John Brevidoro, Christopher's 60-year-old son, who takes six weeks off a year from his legal practice to supervise the harvest. "It doesn't pay to farm anymore," his father said. "But we're not going to stop because everybody depends on us." LW3204: 9600 dpi jpeg from original postcard purchased 2018 by Leon Worden.